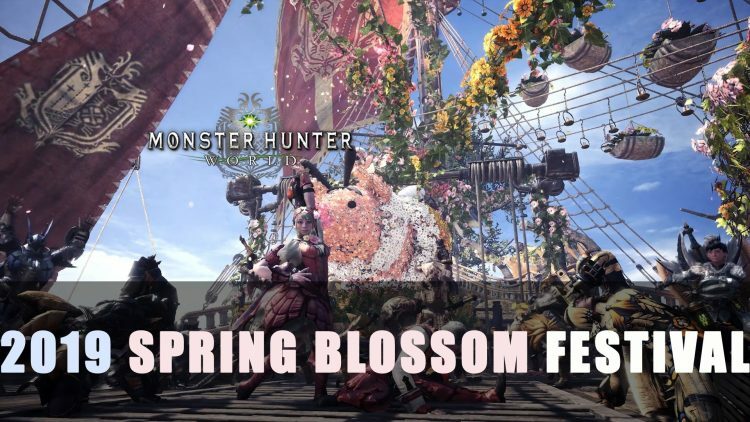 The Spring Blossom Festival for Monster Hunter World will be upon us once again. Those who missed out during the first Spring Blossom Festival may earn them this time. Both consoles and PC will have this festival during the same time although events will differ. Read more to learn everything about this year’s festival! Players will be able to collect Spring Blossom Tickets that are needed to craft the Spring Blossom Festival Exclusive Armor and Weapons. Daily log in bonus will grant 2 Tickets, daily bounties for players to cash in to obtain Appreciation Fireworks and Appreciation tickets. Every Sunday, players can obtain golden tickets. Item sales and special meal platter will return. The Festival will have previously released events quests available for the duration of the event. 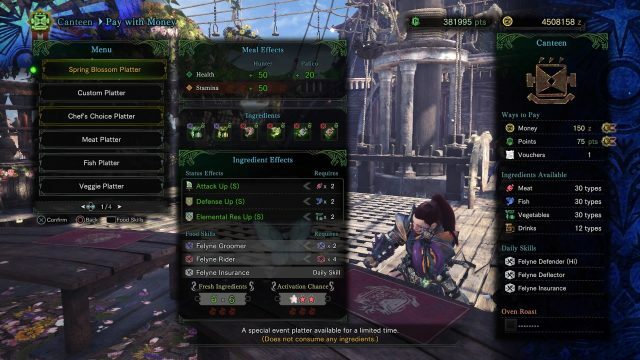 These old event quests offer players new armor pieces, increase drop percentages for items, increase hunter rank experience, and other various benefits. This is a limited time event so make sure you undertake the events you need while they are available. All Events will live unless stated otherwise. Player must slay an Arch Tempered Kulve Taroth. Players will obtain Kulve Taroth Emperor Nugget to forge the Kulve Taroth γ armor. 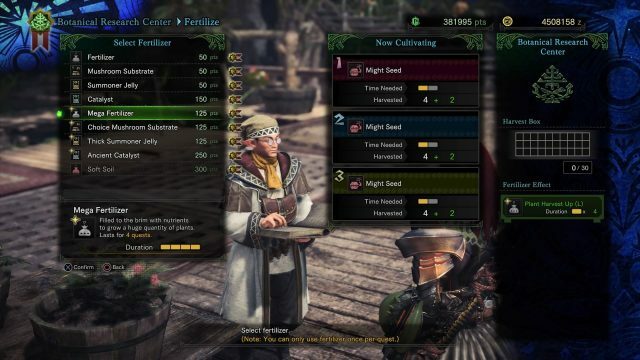 Players will obtain “Watcher Lens” from this event and they are used to make the Watcher Palico Armor Set. Players must slay 3 Great Jagras. 1 is a guarantee small crown while the other is a large crown. 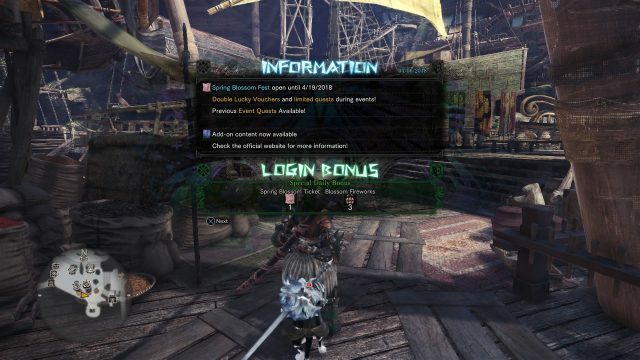 Players will obtain “Azure Star Shard” from this event and they are used to make the low rank Azure Star Palico Armor Set and the Azure Star Blade Longsword. Players will need 6 Azure Star Shards to forge everything. Players must slay a Dodogama and an Azure Rathlos. The Dodogama is a guarantee large crown while the Azure Rathalos is a small crown. Players will obtain “Azure Stargem” from this event and they are used to make the high rank Azure Starlord α Armor Set and the upgrade the Azure Star “Dragon Dance” Longsword. Players will need 7 Azure Stargems to forge everything. Players will obtain “Rockman Ticket” which is used to forge Rockman Palico Weapon and Armor Set. Players will obtain “Master Craftman’s Blueprint” from this event and they are used to make the Wyvern Ignition Great Sword. Player must slay a Anjanath, an Odogaron, a Rathalos, and Teostra. Players will obtain “Black Bandage” which is used to forge Sealed Eyepatch α. Players will obtain “Wiggler Ticket” which is used to forge Wiggler Head α. For the quickest way to obtain the Wigglers players should move from camp 1 to the surrounding Wigglers nest until they obtain all 10. Player must slay 10 Kestodons. Players will obtain “First Fleet Ticket” from this event and they are used to make the Shooting Star Lance and it’s upgrade. Player must slay a Pukei-Pukei and a Tobi-Kadachi. Increase low rank rewards in addition to the Downy Crake Ticket and Steel Egg drops. Player must slay 2 Anjanaths. Increase low rank rewards in addition to the Bristly Crake Ticket and Steel Egg drops. Player must slay a Arch Tempered Kirin. Players will obtain Kirin Ticket to forge the new Kirin Armor γ and Blossom Layered Armor. Player must slay a Arch Tempered Vaal Hazak. Players will obtain materials to forge the new Vaal Hazak Armor γ and Death Stench Layered Armor. Player must slay an Arch Tempered Teostra . Players will obtain Teostra Ticket to forge the new Teostra Armor γ and Dante Layered Armor. Player must slay an Arch Tempered Kushala Doara. Players will obtain Kushala Daora Ticket to forge the new Kushala Daora Armor γ and the Guild Cross Layered Armor. Player must slay a powerful Behemoth. Players will obtain Glamour Prism to forge the Drachen Layered Armor. Player must slay an Arch Tempered Xeno’jiiva. Players will obtain Xeno’jiiva Ticket to forge the Commission Layered Armor. Player must slay a Pink Rathian and a Rathain. Increase high rank rewards in addition to the Faux Ticket and Golden Egg drops. Player must slay a Arch Tempered Lunastra. Players will obtain Lunastra Ticket to forge the new Empress Armor γ and Sakura Layered Armor. Player must guide an Arch Tempered Zorah Magdaros. Players will obtain Zorah Magdaros Ticket to forge the new Zorah Armor γ. Player must slay a 2 tempered Deviljho. One will be a large crown Deviljho while the other will be a small gold crown. Players will obtain Aloy Ticket to forge the new Aloy Full Armor γ and the Aloy Layered Armor. Player must slay an Azure Rathalos and a Rathalos. Increase high rank rewards in addition to the Faux Ticket II to forge the Sealed Eyepatch & Wiggler Layered armor and Gold Egg drops. Player must slay a Deviljho, an Odogaron, and a Lunastra. Deviljho and Odogaron will be roaming the arena and once they are killed Lunastra will emerge. Players will obtain “Senu’s Feather” to craft an Assassin Creed full layered armor and mantle. Players will need to complete this mission 4 times. Then proceed to the Smithy and talk to those inside. When you have the required materials head to where the bounty board is at to complete the deliveries. Player must slay an Great Jagras. Players may obtain Mysterious, Glowing, and Warped Feystones. He will spit up several times during the fight which will leave behind shinies. Collect these shinies to obtain decorations. Make sure you let him eat as its possible to DPS him so he can’t eat. Players can obtain the Faux Ticket III upon completion. This will be live from April 25 to May 2. Player must slay an Lavasioth. This quest is great for those looking to obtain Warped Feystones as on low avg its possible to always get 2 from simply completing the quest. Those lucky may get up to 10. Players can obtain the Beetle Tickets upon completion. This event will be live from May 2 to May 16. Player must slay an Ancient Leshen. Players will obtain higher quality Leshen materials that will be required to upgrade the Witcher’s Silver Sword into the Witcher Silver Sword+, Zireael, Ciri’s Full Armor, Ciri’s Full Layered Armor, and Geralt’s Full Layered Armor. Players will obtain a good amount of vouchers upon completion. Players can obtain a decent amount of armor spheres. Event provides a high chance of Armor Spheres upon completion. April 5th to April 11th for the Ancient Forest Location. While April 12th until April 20th for Elder’s Recess Location. Event provides a high chance obtain Gleaming, Warrior, and Hero Streamstones. Players must hunt a Tempered Anjanath and a Tempered Azure Rathalos. This event provides players with increased experience. Player must hunt a Bazelguese. Players will obtain increase Hunter Rank Exp. Player must hunt a Tzitzi-Ya-Ku, Paolumu, Legiana, and Pink Rathian. The best way to find the Gourmet Shroomcaps is head towards camp 8 or 11 as they have 2-3 Mushroom Colonies in a somewhat close proximity. Bring your gathering set to finish this quest even faster. Players will be able to find ample Elder DragonTracks. Players must guide Zorah Magdaros. Players must hunt a Diablos and a Black Diablos. This quest has both Diablos and a Bazelguese; nothing special to report. Players will have to slay a Nergigante, a Lunastra, and a Teostra. All of the following will be found in the Gathering Hub at the Arena Counter under Challenges. Player must defeat 10 Gajalaka while avoiding a Barroth. Players will obtain “Summer Insect Guide” from this event and they are used to make the Butterfly armor α & β, the Queen Bee armor α & β, and the Butterfly Layered Armor. You must slay 30 Vespoids. Players will obtain Spring Insect Field Guide upon completion which is used to forge the Qeen Beetle Set. Players will obtain “SFV tickets” from this event and they are used to make the Ryu Full Armor Set. This event is available for all; no SFV save data required this time. Player must slay a Pink Rathian. Players will obtain “SFV II” which is used to forge the Sakura α Full Armor Set. Player must slay a Nergigante. Players will obtain “SFV III” from the above missions which is used to forge the Ryu α Full Armor Set. Players must slay a Great Jagras, Anjanath, and Rathalos. Players must slay a Teostra, Kushala Daora, and Nergigante. Players must slay a Bazelgeuse. Players must slay a Lunastra. During the Festival, the weekly bounties are now daily bounties. Heavy Armor Sphere which is worth 200 points will be coming back. Players can acquire one every other day so make sure you’re doing the bounties! All items that need Summer Twilight, Autumn Harvest, Winter Star Tickets and/or Appreciation Tickets. Players must slay a Rathalos and an Tzitzi-Ya-Ku. For all your Monster Hunter needs stop by our Monster Hunter World Wiki. You can also check out the most recent guides in Monster Hunter World: Arch Tempered Nergigante and Monster Hunter World: Patch 6.00 Notes & Witcher Collaboration Event. 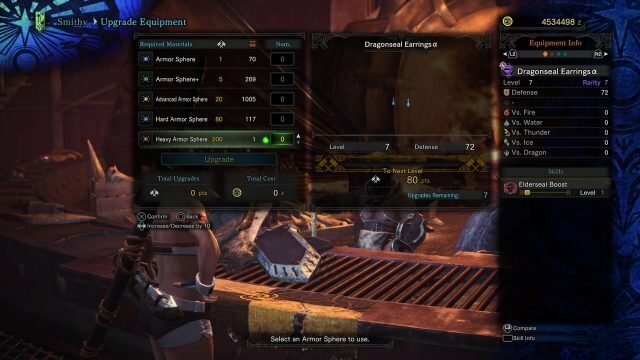 If you are looking for more Monster Hunter World info, you can go in-depth with our featured guides: All Armor Limits, Everything about Kulve Taroth, Long Sword Elemental Limits, Dual Blades’ Max Element & Status Limits, Attack Values & You, Crown Sizes & You, Monster Hunter World: The Canteen Explained With Ingredient Guide or Monster Hunter World: End Game Guide. If you are interested in Monster Hunter World builds, you can peer into them at: Dragon Longsword Build, Raw DPS Build, and Elemental Crit Build For Sealed Weapons.